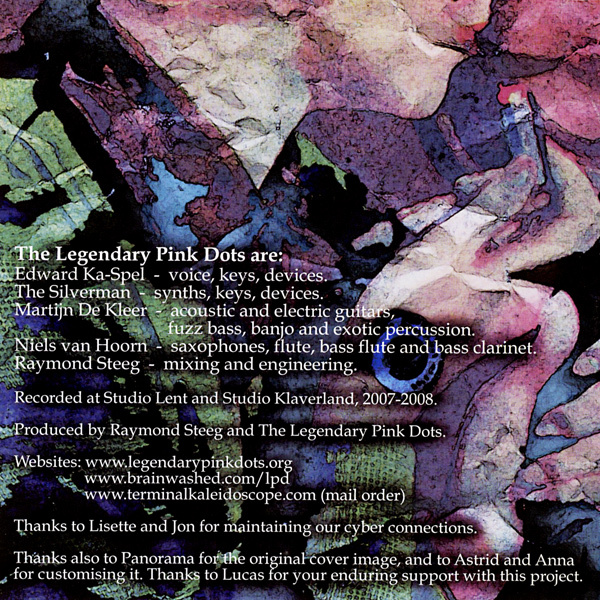 For those of you who don’t know, Edward Ka-Spel is a founding member and driving force behind The Legendary Pink Dots. 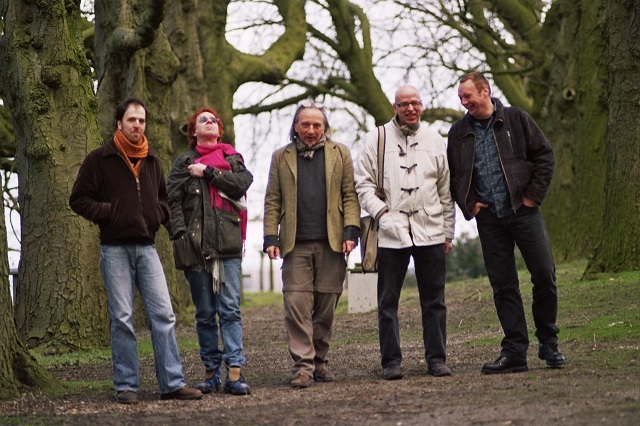 Both Edward and the Dots have a long and prolific recording career, dating back to 1981. Edward and the band for that manner are very friendly to their fan base. They will talk with fans after their concerts as well as taking time out of their demanding touring schedule to reply to emails. Edward has been interviewed countless times over the years and I attempted to avoid some of the more typical interview questions, focusing instead on topics that may not have been covered in the past. 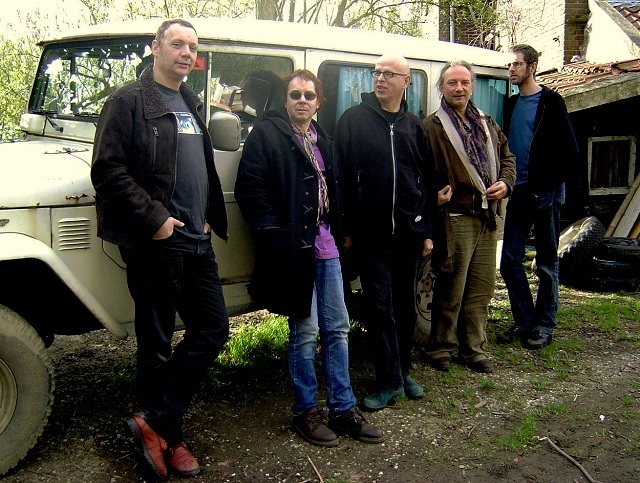 You are a founding member of the Legendary Pink Dots as well as a composer, poet, and musician. What do you think is your primary role and why? I hope it isn't a cheesy answer but I do what I have to do... No choice in the matter. It's my calling, my reason for being on the planet and I hope I leave as a better place than when I arrived (although that may well be difficult considering events of the last few years). You are a prolific songwriter. Your musical output is phenomenal and doesn’t seem to be slacking off as the years go by. With your frequent tours of Europe and the United States, how do you find the time to write, record, and rehearse? Your music is obviously not improvised on stage, so it does take effort to prepare for a tour. Onstage the music is actually looser than it perhaps appears, but I can't pretend that we don’t rehearse beforehand (not massively, but enough). I try to create something every day, while some pieces slowly evolve over the months (even years). I admit I have little command over the “normal daily things” that's a chaos and always has been. There is a strong science fiction theme that runs throughout your music, though this topic hasn’t been explored that much with you. How long have you been a fan of science fiction? Who are your favorite authors and how have they influenced your music? What are your favorite science fiction books and movies? 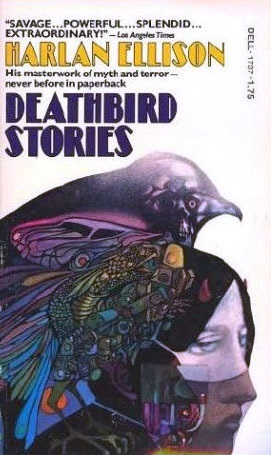 I think it was Harlan Ellison who first caught my attention around 30 years ago with Deathbird Stories. That book opened a door for me as I realized then that sci-fi wasn’t just about bug-eyed monsters and green men in spaceships. Of course I’m influenced by great thinkers like Ellison, Silverberg, Heinlein, and Vonnegut (I could go on). This is not mere entertainment. Great sci-fi movies are rare I think, but I should declare that my favorite film of all time is The Medusa Touch closely followed by Slaughterhouse 5. You are a consummate story teller and that talent appears in a number of LPD songs as well as in concert. From following the concert reports on the Cloud Zero discussion group when the band is on tour you have varied your stories from venue to venue. How much of your story telling is spontaneous and how much is thought out in advance? What do you draw on for inspiration? I usually find a first line in the dressing room a few minutes before I go on stage and hang onto the idea until it’s time to spin the yarn. Then it tends to be spontaneous (with varying results). Since the early days of the Dots, both you and Phil have remained band mates. What has made this possible? A great friendship and a mutual respect. Sometimes it makes me tremendously sad that the incredible compositional contribution Phil makes to the band isn't recognized as much as it could be. One of the many things that endears you and the band to your fan base is how friendly the Dots are and their willingness to talk with anyone before or after a performance. I know it is a positive experience for the fans, but has it always been positive for you? Would you care to share any interesting anecdotes? Given the long musical history of the Dots and your solo career, thinking back over the years, if you could do it all over again, is there anything that you would do differently and why? Forgive the pun, but that's down to dots and quavers. Sometimes I hear greater potential from a song than the reality of what is actually released. But in the bigger picture, I’m mostly fine with how things went. 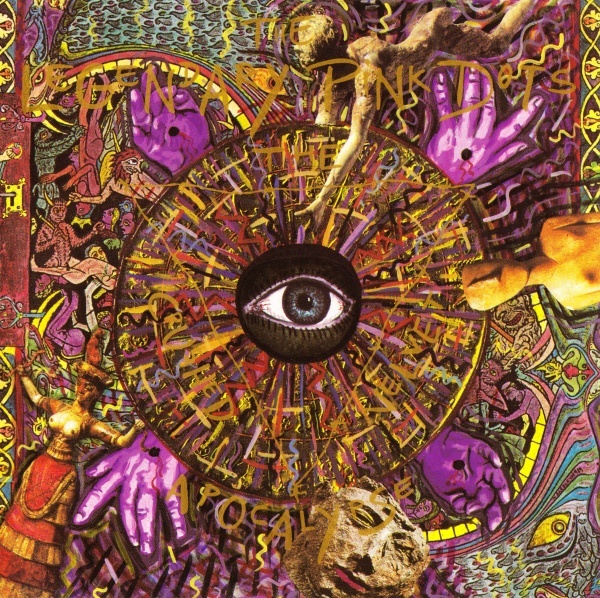 Other than your band mates, what do you see as the Dots’ single greatest strength and why? I think we can make someone laugh at him/herself even at the very darkest moments. We offer perspective in a world which seems to be losing it. I visited Klaverland (the LPD home base and studio in Holland) back in the late 80s. The band was on tour at the time, but I was impressed by how calm and remote it was there. How does the Klaverland environment influence your life and music? It's a rare place of peace in a crowded and often unpleasant little country (it wasn't always unpleasant, but that's another story). Still, to be honest, I think the music comes from a place that isn’t physical at all. Plutonium Blonde (LPD) and Dream Logik Part Two (EKS solo) have just been released. What are your next musical projects? A new Tear Garden album (an ongoing collaboration project with Skinny Puppy’s cEVIN Key) is being mixed as I type, but beyond this the next months will be spent touring or planning live shows. 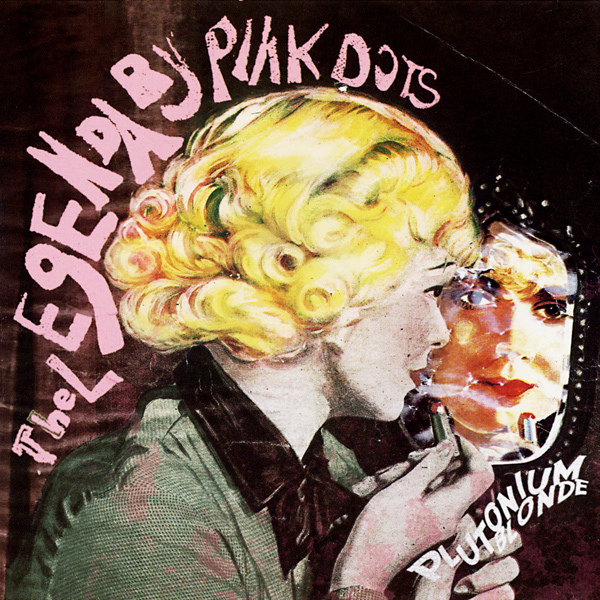 Please tell us a bit about the new LPD release, Plutonium Blonde. What does the title mean? Plutonium Blonde was an album which simmered for a year as we slowly added colors to the canvas. A true labor of love. "Plutonium Blonde" simply reflects power and beauty with a dash of humor thrown in for good measure. It fits, we think. With each new Dots release I listen to enjoy the music and not try to over-analyze it. But is there a theme that runs through the ten songs? If there is, it is not obvious to me from the song titles and the songs are pretty varied. For example “Torchsong” has a martial and industrial feel, “Rainbows Too?” is like one of your earlier waltzes updated to 2008, and “A World with No Mirrors” is a beautiful folk song. There's always a line running through the songs although it shouldn't be overstated. Every album represents the mental and emotional states of the makers at a given time. 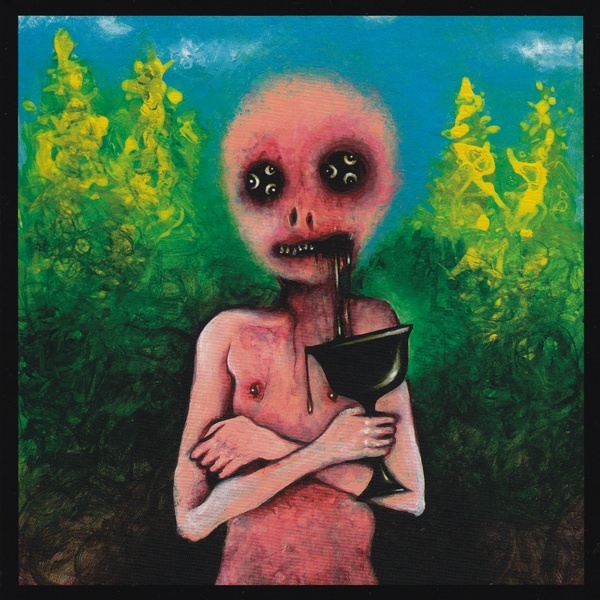 This album is no different in that respect, but I feel it has turned into one hell of a roller-coaster ride. For the first time since Crushed Velvet Apocalypse we took a few of the songs on the road with us and actually re-recorded them after the tour as well. Nothing spared for this one. One thing that I have always found intriguing with your music is that a phrase or line from one song becomes the title of a totally different song on a subsequent release. Am I missing some linkages here? Or is this whimsy on your part? It's necessary to look at the Dots as you’d look at a very detailed painting (maybe the picture of Dorian Gray). Links run through it all, perhaps inevitably. You mentioned earlier that Phil goes unrecognized for his compositional contributions to the Dots’ music. Some bands credit individuals on each song, but I don’t recall ever seeing that on an LPD release. So would you please describe how the band approaches composing a song? Credits? I just never liked the “I wrote this, I played this” syndrome. I always preferred how say the Doors or Joy Division presented themselves with a focus on the creations rather than the individuals. Did the band share equally in writing the songs on Plutonium Blonde? I can’t really hear a song and say that is Phil’s composition, or this one is by Niels, or you wrote this other one. Musically Plutonium Blonde is close to a 50/50 split between myself and Phil with much collaboration between us as it developed. The two acoustic guitar songs emerged out of sitting in the kitchen with Martijn. I have the words and he always finds the chords. I am curious about a couple of the songs on Plutonium Blonde. Is a “Zonee” a cell phone? Is it a brand available in Europe, or just a name coined by the band? The song has a catchy melody. And what is the relationship between “Rainbows Too?” and the other rainbow songs you’ve recorded? Indeed a Zonee is a mobile, but the brand name is made up. “Rainbows Too?” has a direct relationship with “You and Me and Rainbows” for me. One element of the Dots’ music I thoroughly enjoyed from the early days was the violin. It is has been quite some time since Patrick left the band, but do you miss having a violinist in the group? I do miss Patrick. He is a wonderful musician, and it is great when we go to Italy (where he lives now) to have him sometimes spontaneously join us on stage. The rhythms of your music are normally provided by Phil’s synths, but do you miss having a live drummer in the band as well? I remember seeing the Dots in Denver in the late 90s and Ryan Moore was quite versatile on the drums. Similarly I miss Ryan, and no drummer could replace him. Still he has a very personal musical direction and needs to follow it. Each time that I have seen the band perform, you play current music and a selection of older songs. How do you decide which older songs to play? Which songs are the audience favorites? Audience favorites? Definitely “Belladonna,” crowds actually chant for this in Poland. And then pretty much anything from Crushed Velvet Apocalypse. Still these songs are fun to play. From reading the Cloud Zero list, fans will contribute their impressions of the shows they have just attended. Many times people will complain about other people in the audience talking through your sets. How is it for you on stage to have people in the clubs more intent on socializing than listening your music? Talking at shows? It used to be awful in Holland especially, but this is much less these days. In general it's a problem that has gone down with time. Still, no I actually hate the scenario where people hang out at the bar with their backs to the band. It’s rude. It is hard to believe, but the Dots are into their 27th year of performing and recording, what does the future hold for the band? There are not that many bands today that last this long and remain vibrant. Do you foresee a day when the Dots will no longer tour or record? I can imagine that it can get tedious being on the road, which is more of a younger man’s world. Sometimes touring can be very exhausting, but if too many months go by without it I become extremely restless. I think we’ll continue recording and touring while we still breathe. You have worked with a number of different musicians over the years. Is there anyone you would like to work with that either you have not met personally or have not had the opportunity to collaborate with? One day I'd like to work with Steven Brown from Tuxedomoon. We talked about it a little when we met, and I think he's a wonderful musician and a kind, good man. What bands and music are you listening to today? I love the music of Andrew Liles. Such joy and so many surprises. Still, I tend to listen to something different every night. Last night it was Roy Harper and Heldon. Edward, thank you so much for taking the time to answer my questions.